In the beautiful valleys of Kashmir, wedding is the celebration of tradition and beauty. Kashmiri wedding are a thing to behold, with the bride and groom resplendent in tasteful traditional dresses with breathtaking handmade embroidery and fabrics at their best. Lets get in to the details of this epic beautiful Kashmiri wedding marriages are proposed by close relatives or ‘Manzimyor’, the Kashmiri word for a local and professional matchmaker. The Vanna or engagement ceremony takes place in front of an idol. The following day a ceremonial cleansing of the house before the wedding takes place, to prepare for the wedding feast, the ‘Waza’ or the cook, puts a clay oven on which the feast will be cooked on the same night musical get-together is organized at the girl andboy’s homes, where they sing traditional folk songs using a drum called Tumaknari. The entrance of the house is decorated beautifully and this decoration is called the ‘Krool Kharun‘.Later, in the evening, the bride follows an elaborate bathing ritual she uses the flower jewellery sent by the grooms family to enhance the bridal glow, After this, henna is applied on the hands and feet of the bride. The ladies of the house also make elaborate designs on their hands. 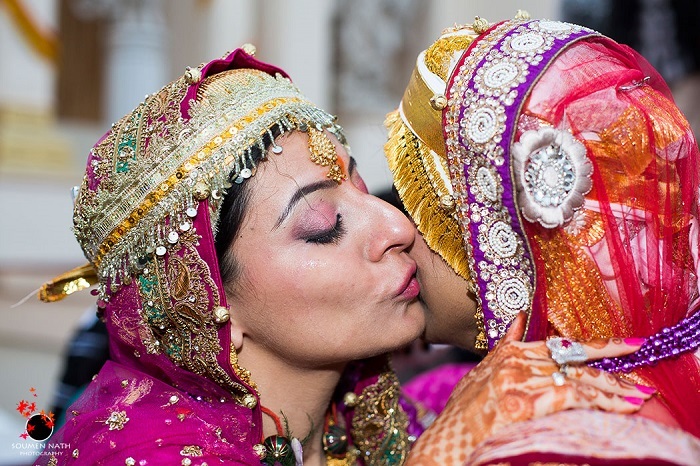 It constitutes of a series of traditions which are religiously followed by both the bride and the groom and their respective families.Friends and close relatives help the bride and groom in getting ready for their special day. Before the groom’s marriage procession leave for the bride’s house, the groomis made to stand on a vyog (pattern made from rice flour and colors). To declare the announcement of the boy’s departure, a conch shell is blown. Two rice pots are taken in which some money is kept. These are distributed among the poor people. The couple is led by the family purohit to the door.In Kashmiri marriages too the purohit performs the rituals in front of a sacred fire. Thereafter, the couple takes their first phera by stepping on seven one-rupee coins. In totality there are seven pheras. At the end of the wedding ceremony, the newlyweds feed some rice to each other.thereafter bride says her goodbyes to all her family members and proceeds to her new home for the beginning of a new life.When the bride and the groom arrive at the groom’s house the exchange of the threads on their heads take place, which is followed by the freeing of two pigeons to mark the beginning of a beautiful relation. 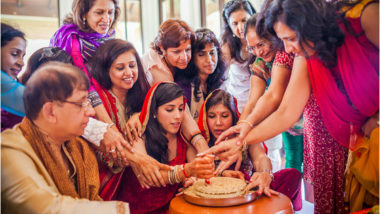 Full of traditional and ecstatic ceremonies Kashmiri Wedding Rituals offer a time of family union for the Kashmiris.